It was windy this morning, but the sea was not as rough as yesterday. Nevertheless I returned from a morning run agreeably salty. In order to retrieve my car, which I left at a party last night, I ran over the fields to Bishopstone and then down to Seaford front, to Splash Point, and back as far as the Beachcomber, where I finished; the weather still grey, though visibility a little better than yesterday. 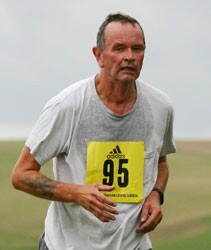 My son was sailing at Piddinghoe, so I took advantage of the opportunity to start a run at Piddinghoe. I had hoped to head north, to the downs above Kingston, but I followed a runner I saw taking an uphill lane off the road to Lewes. This led to Lodge Hill. then a road through the back of Telscombe (part of the Mince Pie Ten Mile route), to Cross Dyke and over the top of Telscombe Tye. It was grey, foggy, and felt cold when running into the wind. I ran to Frog Firle and High and over on a grey foggy morning, but here and there sloes and rose-hips still coloured the hedges. I've been very dilatory, both in running and in posting about it. I have two runs to add here, one on Monday, a brief trot up behind the golf course and back, and today's, over the truncated version of the University of Sussex Health Week route, a longer, exhilarating affair, as the fog lifted and the sun came out, to Loose Bottom and through the woods with Claire, a last run before the university shut down for Christmas. On Friday I ran with Claire, Jana and Steffi to Stanmer Park and through the woods, my first run since Sunday's race ; this morning I ran down to the front before dawn, there being no time for a long run today. I ran the Mince Pie Ten Mile in bright sunshine, and a slight wind, far better conditions than the weather forecast had offered. It;s a strange route, contrasting stretches with beautiful views with some rather dull sections through the bungalows of Peacehaven and Saltdean. This was my last race in 2006. My next target, on the way to an as-yet-unentered spring marathon, is the Sussex Beacon Half Marathon, in just under ten weeks time. Latest news: the results are up. My official time was 1:28:16, so the Forerunner did not lie, and I was 163rd out of 291 runners. I ran through Stanmer Park and the Great Wood with Claire of the BSMS runners, for my last run before the Mince Pie Ten Mile. It had rained a great deal in the morning, but was dry for our excursion. The Forerunner did not start for the first half a mile or so, so add a little on to these figures. Yesterday I took the car to the Seven Sisters, parked in the car park and ran along the Cuckmere to its mouth, which made exactly a mile for a warm up , and then ran twelve 2 minute hill sessions with three minute jog recoveries up the lower slopes of Haven Brow. I varied the ruote for the climb session and discovered that I am bad at guessing at inclines, for apparently similar bits of the Seven Sisters were by no means uniform. Today, in a fierce wind, i did what was supposed to be an easy five miles to Splash Point and back but in the wind it felt anything but easy. I ran a slow three-mile route up behind the golf club, in fine weather but with cloud gathering.